If speed could, paradoxically, be represented by a fixed point in space, then that point is unquestionably the Ellis System. Home of the Murray Cup, the most famous racing event in the galaxy, Ellis is a star system that plays off its reputation to any tourists or other visitors who pass within a light-year of the outer worlds. Despite this, Ellis is actually a very interesting star system on its own merits: from hordes of indigenous life forms that are unlike anything present anywhere else in known space, to an economy based on something other than ship part construction, to the sheer number and variety of planets present in the system, Ellis is worth at least one voyage. Cosmologically, Ellis is an F3V Yellow star with an especially thick green band, allowing an unusually high amount of human habitation. 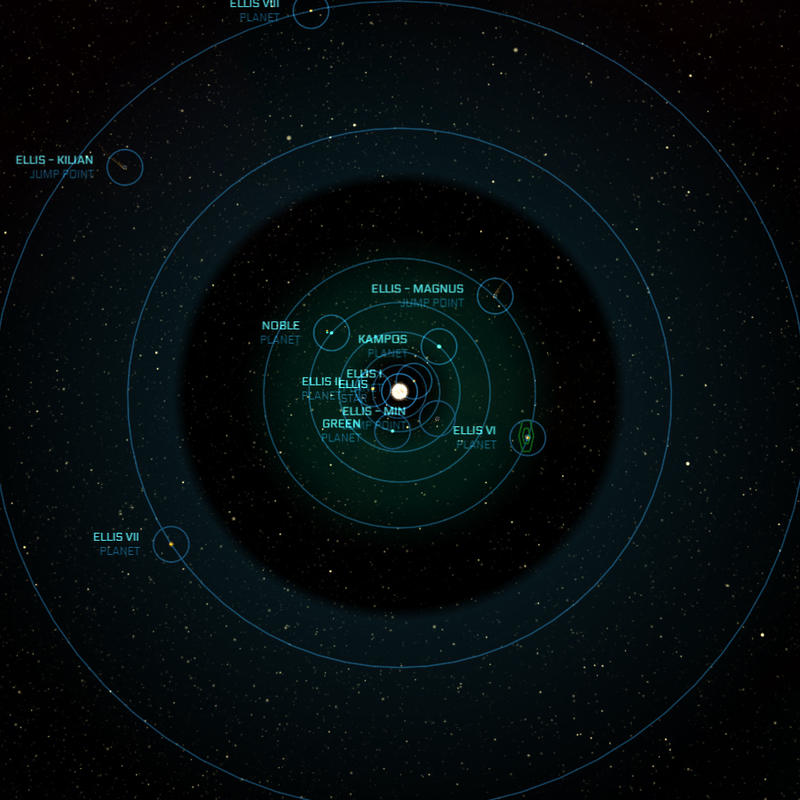 The system is located in a highly developed region of UEE space with strong jump ties to Nexus and Kilian. Politically, it is a corporate owned star system, although this is more trivia than an actual issue of governance. Despite its association with space racing, Ellis has never been a manufacturing powerhouse; instead, it exports unrefined minerals and seafood to other populated systems in the local star cluster. This thirteen-planet system contains a wide habitable zone thanks to its F-type main sequence star. Ellis is mostly known as the home of the UEE's most famous race, the Murray Cup. What began as a way to kill time during the terraforming process has become big business; fuelling the economy for the three terraformed planets -- Green (Ellis III), Kampos (Ellis IV), and Noble (Ellis V). Ellis' eleventh planet recently collided with its moon, leaving an asteroid belt in the former orbital path. Ellis is a Main Sequence Dwarf-F star. Ellis II's large size, proximity to its sun, and surprisingly thick atmosphere have left its entire surface a massive desert, marked with strange swirls and ridges created by frequent massive storms on the planet's surface. The vast oceanic world is mostly known as the primary resort destination for racegoers who enjoy Green's high-end mega-resorts. In an effort to protect the elaborate underwater reefs, ships landing on the planet are directed towards specific landing zones. The emerald jewel of the system, Noble is known for the vast stretches of woodland, evoking many comparisons to an undeveloped Earth. The local Governers Council has made sustaining the planet's natural beauty a priority. A terrestrial planet located just outside the system's green band. Although the planet is technically uninhabited, Ellis VI has been used to conduct studies about human habitation. The second gas giant in the Ellis system, Ellis X features a consistently turbulent atmosphere. It was this chaotic nature that led to its local nickname of Bombora. Though techincally not a planet, Ellis XIII is considered a local mascot. This protoplanet's unique shape has given it the nickname Pinecone. Apart from the remains of Ellis XI, the Ellis system contains one asteroid belt. Belt Alpha is located between Bombora and Ellis XI.